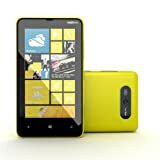 nokia lumia unlocked – Nokia Lumia 820 Yellow Factory Unlocked Smartphone Windows 8 Dual Core 1.5 GHz 8 GB 4.3 inches – Express Shipping! Memory	:	8 GB. / 1 GB.